Three Palestinians were killed and hundreds were injured Friday during the fifth weekly "March of Return" rally along the Israel-Gaza border, officials said. 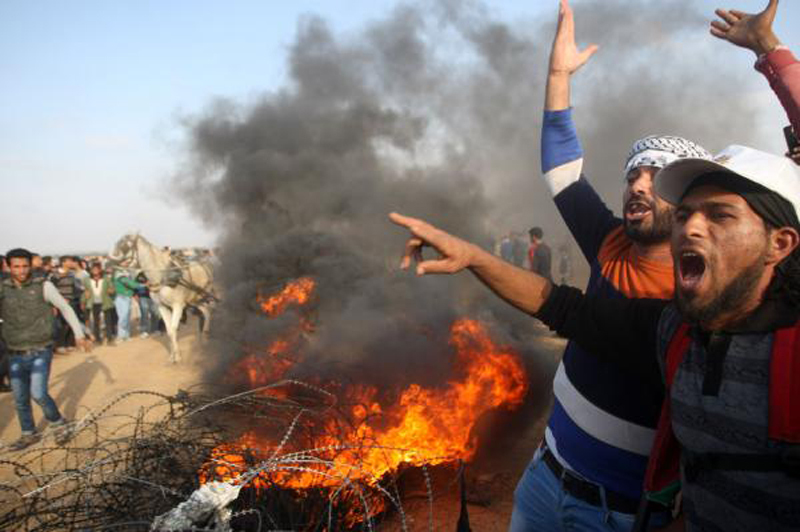 The Israeli military said it opened fire at the crowd after hundreds of Palestinian rioters tried to burn the fence and enter the Israel throwing explosives, fire bombs and rocks. UN Human Rights chief Zeid Ra'ad al-Hussein said Israel must address what he called an excessive use of force in Gaza -- saying the loss of life is "deplorable" and the number of injuries is staggering. Last week, the Israel Defense Force again dropped pamphlets over Palestinian demonstrators, urging restraint and defiance of Hamas. "You are participating in violent disturbances. Hamas exploits you to carry out terrorist attacks," the read, in Arabic. "The IDF is ready for any scenario. Avoid using weapons and carrying out violent acts against Israeli security forces and citizens... Don't listen to Hamas' instructions as this will endanger your life. Your future is in your hands." Protests are expected to continue after May 15, the day the Palestinians mark the founding of Israel. Ismail Haniyeh, head of the Hamas political bureau, said the demonstrations during the month of Ramadan will deal with many challenges -- including a peace plan by U.S. President Donald Trump. Haniyeh called the plan the "deal of the century." "We will turn this deal into a resounding slap in the face for the administration in Washington and anyone who weaves conspiracies against the Palestinian people," Haniyeh said. Since the mass protests began March 30, at least 40 Palestinians have been killed and more than 5,500 injured, according to the U.N. Office for the Coordination of Humanitarian Affairs.